Start writing down a list of family, friends, neighbors and co-workers that you would like to give a gift to. This year could be the year where you give the gift of your time. This could mean offering your time to help with their grocery shopping, or doing some errands or help cooking for the holidays. Some people don’t necessarily need gifts but the gift of your time may be just what they need! Consider making a change this year and donate gifts or money to charities in your area that you are passionate about. There are several ways that you can contribute a gift to a family members favorite charity, or donate money for a scholarship to your kids high school or college alma mater. And unfortunately we may know someone who is dealing with a death in the family and would be grateful if you contributed to one of their charities. Before the holidays start and you know you will be cooking, go through your pantry and determine what food ingredients you have already that is GOOD to use for your meals. When I work with clients and they ask me how long a certain type of food is good for, I ask them “If you were to use this food ingredient today to cook or bake with, would you use it?” If the answer is no, then you should get rid of it and no need to keep it if you are not going to use it now or it may make you feel sick. If during the holidays is the only time you bake and you have not used those ingredients for a year, consider getting new ingredients. Introduce your kids, friends and even co-workers to watch great holiday movies and attend holiday events! I know there are many wonderful movies now on the Hallmark Channel for the holidays, and classic movies on TV or purchase the DVD. Also check out your local community announcements for events for kids and adults. It is great to get out and enjoy the happiness at this special time of year and to spend time together! 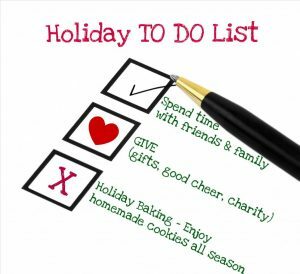 If you need some holiday organizing help or consulting advice concerning your home or office, please let me know and I will be happy to help you. I hope you all have a great holiday season and a wonderful start to 2019! I can not believe that summer is coming to an end and the kids are all going back to school. I know the weather will be great for several more months so I hope you enjoy this time of year! Also if you are sending your kids to college for the first time or they will be graduating soon, I am sure you have thought about converting your kids room into an office for yourself, a reading room or another sibling has claimed the room now! Before your kids go off to school, I hope both of you were able to go through and clean up their bedroom while they were packing up the things they need for school. After they leave, go through their room and do a thorough cleaning of their room. If there is any furniture that is damaged or no longer needed, this is the time to dispose of it or donate the items if you feel it could be used by someone else. Organize and collect the items that you and your kids feel is memorabilia and put them in clear plastic bins. Label them for example as “John’s memorabilia”. This will not only help with organizing their bedroom but it will save you from dusting all of the items! Now that your kids are adults and off to college, I feel this is the time for them to take ownership of their items. What do they feel is important? What do they feel they can let go of? This is a major step in their lives and I know many of them are ready for the change and the challenges of college. The quote of “less is more” is very important here! As you go through the bedroom, you may find dishes and silverware that you have been missing due to your kids took some food to their room and the dishes disappear there. Or you find items that the kids say that they lost and after you organize the room, you find them. And my favorite part of organizing is I always find money! The kids and parents are excited for the find and they say organizing is fun! One of the most important ideas here is to make sure that your kids feel like this is their home and their room but is now organized and cleaned up. I have worked with many families with kids who have left for college and have returned for breaks and they LOVE their “new” rooms and really appreciate all of the work and organization that was put into their space. When I help families to organize, declutter and set up a new space in a college kids room, I make sure that all of the family members are in agreement on how we handle the change. This is a great time to also use the 8 month rule of storing the items away or packing them up and moving them out of the space. And at the end of the time, if the items are not needed or wanted, consider disposing or donating the items. Especially after the first year of college, their high school years will seem like a million year ago! 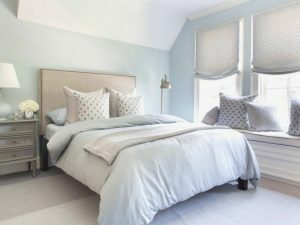 I hope you all have a great fall season and if you have any questions or need help moving forward with the project of converting your college kids bedroom into another space, please contact me and I would be happy to help! I know the calendar says spring, but in many parts of the country it feels like it is the middle of winter with all of the snow and cold! I promise it will be warmer and spring like weather will be coming soon! When you set up your physical therapy sessions or doctors appointments, create a folder to start collecting all of your paperwork and instructions pertaining to your appointments. Label the manila folder for example: “Right leg physical therapy – April 2018” or “Medical insurance bills – April 2018”. The important part of labeling your folders is to be as specific as possible and keep it simple. 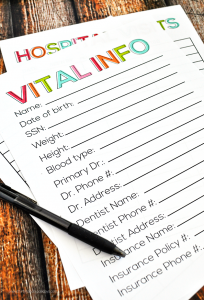 Create a manila folder just for the paperwork from your doctor and your appointments. And create a separate folder just for the incoming medical statements from your insurance company. Keep track of all of your appointments with your doctor(s) and the dates that any tests that you need to have done. For example, keep track of when you had tests done at the doctors office, blood work or dates of your physical therapy sessions. This will help you with comparing dates and charges when you get your statements from the insurance company or invoices. There is so much paperwork when it comes to medical appointments and being organized helps you to stay on top of things. If you are handling all of your family’s medical statements and invoices, another suggestion is to color coordinate the manila file folders for everyone in the family. Also use binders to get organized when you have a large amount of papers that you are dealing with. For example, you can have blue color folders or binders for yourself, green for your husband, pink for your daughter etc. Office supply stores for example Office Depot and Staples have a variety of file folders and binders at the store or online for you to choose from that will work best in your situation. If a member of your family has an ongoing medical situation, using different color binders also helps to stay organized and not overwhelmed with the paperwork. This is helpful to keep track of past and current doctor notes, tests and procedures in case you have questions to clarify a discussion or if you choose to change doctors. If you are recovering from a procedure or a surgery and you can not really comprehend the paperwork at this time, at least put anything that relates to your medical situation in a bin, basket or a folder. And keep it separate from all of the other bills, school papers from your kids and junk mail that you receive in the mail. Once you are able to work on the papers, at least it will all be in one place and you can sort it out then. Once you organize and take control of your medical paperwork and understand it, it will be easier for you to sort and file. If you have additional questions for me about this process or need some hands on organizing work with your paperwork, please contact me and I would be happy to help you out. Thank you and I hope you all have a great spring!